The city provides traffic news through NIXLE. Signup today thru the home page of Novi's website at http://www.cityofnovi.org/ to receive text message updates. ​Through a partnership with The Omega Group and Oakland County’s Courts Law Enforcement Management Information System (CLEMIS), the Novi Police Department is able to provide current information on crime locations. Crimemapping.com is a cost-effective, web-based mapping system of Novi which allows visitors to view reported, verified criminal activity near an address; select crime types and date ranges; and generate reports. 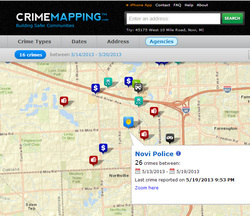 Data is transferred to crimemapping.com daily from reviewed Novi Police crime reports. 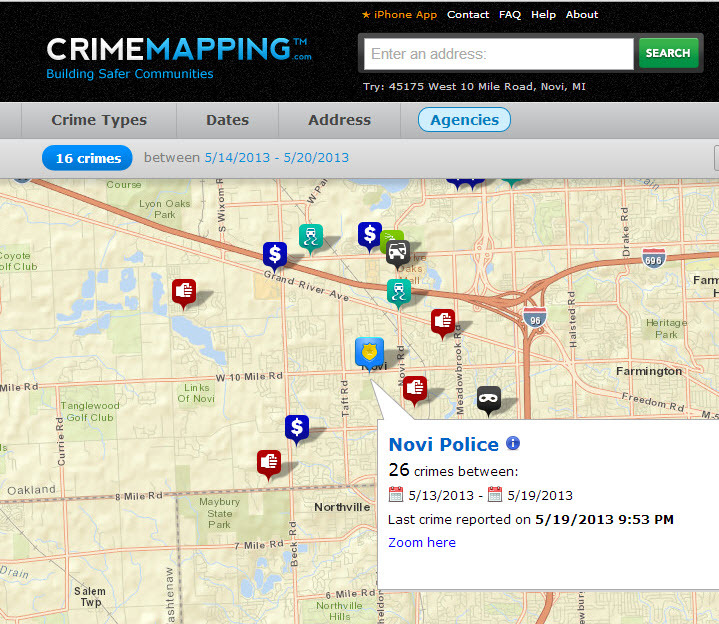 Novi Police crime data will remain available on the site for six months. To view Novi’s reported criminal activity, click here. Interested parties with an IPhone may also download an application to view the information from their handheld device.